My name is Tim Spriggs, an Englishman who lives and works in Singapore. For the past couple of years a group of friends and I have undertaken a short golf tour elsewhere in Asia, last year in Danang Vietnam and this year in Thailand. 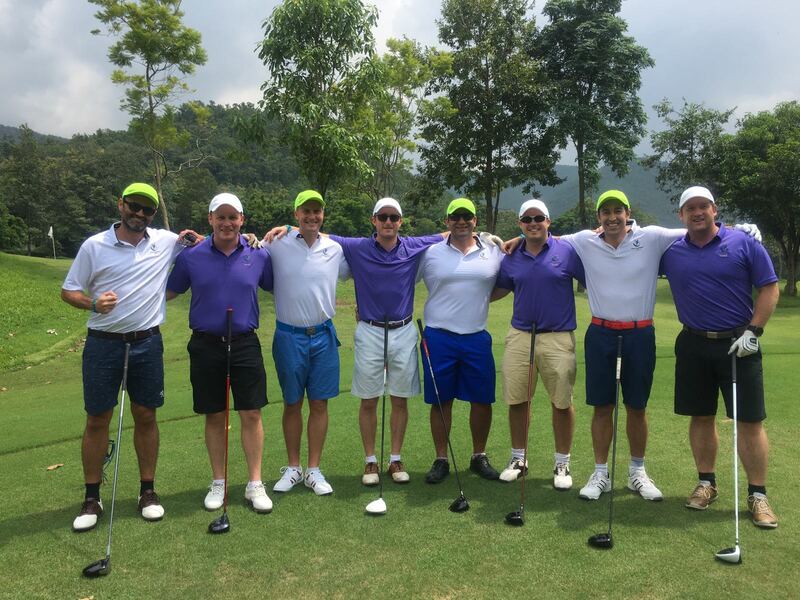 Whilst we play in Singapore, membership is prohibitively expensive so travelling works out cheaper and we enjoy exploring new places and their golf offer. We loved Danang, but having done quite a bit of research knew that Thailand would be great fun with superb food and some decent nightlife. Notwithstanding, we weren’t yet ready for a venue such as Pattaya and thought that Chiang Mai would be a sensible “christening”; for many of us this was the first visit to Thailand. Working with Golfasian came about because of a simple Google search. Their website was comprehensive and informative and our initial enquiry was responded to promptly which always impresses. We were given some excellent advice about which courses to play and where to stay, preferring downtown. This was only a 3-day trip but it felt good to have everything organised and allowed the golf to take centre stage. On the side, I worked with Mike Moyer of Fenix Golf to organise team shirts, caps and prizes: Mike was incredibly helpful given this was only a small order (8 players) and he really took care of us. Everything went without a hitch. Local travel arrangements, hotels and golf all materialized without a single issue. There are no compromises, no snags and no surprises. Every day we had some sort of team competition that culminated in a finale at Gassan Khuntan. The après golf started in the bar post the round with prizes and some “fines” various from appearing late for breakfast to not driving past the ladies’ tee (no names, no pack-drill). Chiang Mai was beautiful and the people at all levels so welcoming. The food is sensational and golf courses are magnificent. 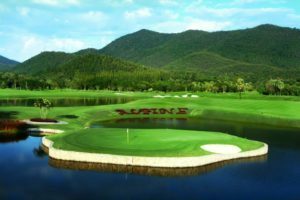 We first played Alpine which was notable for its superb and very challenging par 3s, then 36 holes at Highlands (our favourite) whose backdrop was breath taking, and finally Gassan Khuntan which was super-challenging. Khuntan is in a truly exquisite setting located in the lee of the northern mountains of Thailand. The extensive water hazards will challenge most golfers so bring your best game to this course. It is shameless and can strip away your dignity, but what a pleasure. You cannot talk golf in Thailand without recognising the delightful Caddies. Those gentle people who give intuitive advice, moral support, best club selection and playing strategies to suit the course and your game. My experience tells me to listen and follow their wisdom. All the group agreed that golfing in Thailand was special and are now planning a return. I would like to thank Golfasian for making it all possible in such a seamless way. We loved every minute and will return!